Create your own mouth-watering Crispy Rice Mickey Treats from Walt Disney World at home with this easy recipe. Are you following our new Disney account @SweetDisneyDelights on Instagram? Disney snacks have a special place in my heart. So much so that I look forward to all the yummy park snacks I will enjoy as much as the vacation itself. Disney certainly goes above and beyond in all the creative food ideas they have at both the parks and resorts. From the famous Rose Gold Cupcakes to Mickey-shaped treats, what’s not to like. What I don’t like is having to leave Walt Disney World to come home. Re-entry after a Disney vacation is hard, but there are so many ways to make that Disney magic last well after your vacation. 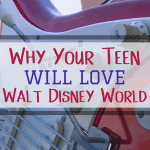 (You can read about How to Cure The Post Disney Blues here). Making your own Disney Treats is one way to continue the magic. 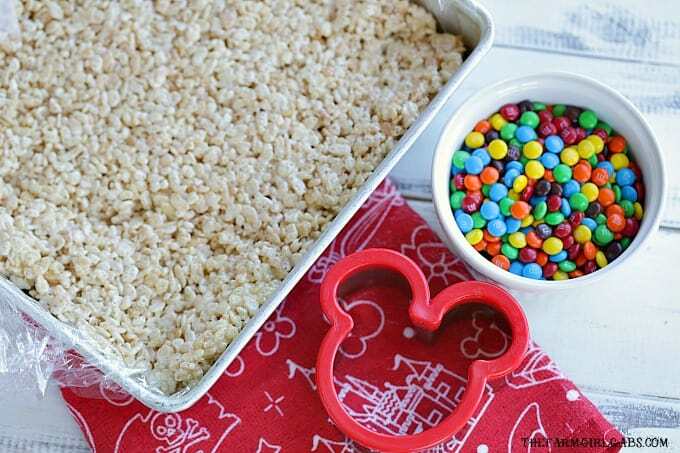 These Crispy Rice Mickey Treats are probably one of the easiest Disney treats you can make yourself. It’s a classic Rice Krispy recipe, cut out with a Mickey Mouse sandwich cutter and then topped with melted chocolate and miniature M&M®. I use a 13 x 9 sheet cake pan to spread out the crispy rice treats. You want to make sure that it is at least 1 1/2 inch thick so you can fit a popsicle stick in the center. Use the Mickey Mouse sandwich cutter to cut out the treats. I can usually get 6-7 big treats per recipe. 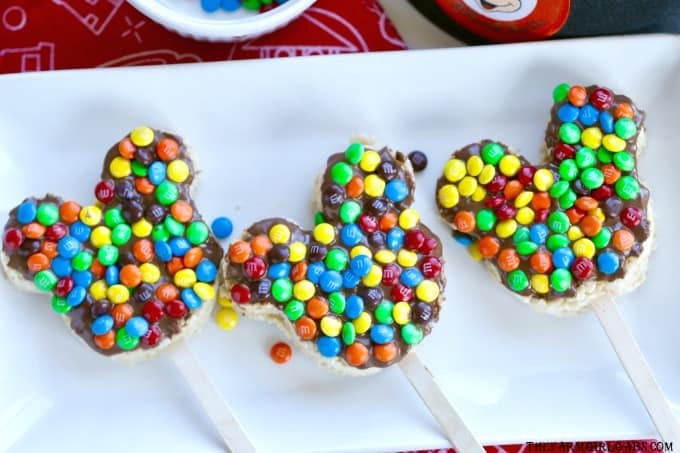 After you cut out your Mickey treats, insert the popsicle stick in the center of each and spread some melted chocolate over the top. You can also dip them but I find its easier to just spread the chocolate with a spoon. Now just pile on the miniature M&Ms®. The more the better. Let them sit out on a baking rack to dry or you can pop them into the refrigerator to make them dry quicker. 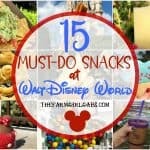 These are not only great “just because” treats, but these Crispy Rice Mickey Treats are perfect birthday party treats. 1 cup or more if needed miniature M&Ms. In large saucepan melt butter over low heat. Add marshmallows and stir until completely melted. Remove from heat. Add crispy rice cereal. Stir until well coated. Using wax paper evenly press mixture into 13 x 9 x 2-inch pan coated with cooking spray. Cool completely. Mixture should be about 1 1/2 inches thick. While treats are cooling, add chocolate to a bowl along with oil. Place bowl on top a small saucepan filled with a small amount of water on stove. Bring water to simmer and melt chocolate. 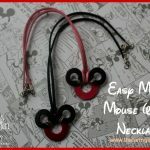 Once cool, use a Mickey Mouse Sandwich cutter to cut out the shapes. Stick a popsicle stick in the center of each. Spread melted chocolate over each Mickey treat. Top generously with M&Ms. Want to save this recipe for later? Just click on the photo below to save to your Pinterest account. 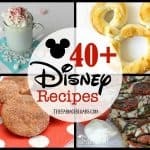 « 40 Disney Recipes To Make Your Day A Little More Magical!